A complete maintenance kit containing 4 oz. 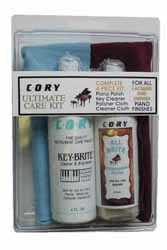 of Key-Brite to clean and brighten your plastic or ivory keytops, plus a 4 oz. All-Brite polisher to moisturize and protect satin lacquer finishes. Cleaner and Polisher Cloths included.